Stylish, colorful and so well done! I love the zebra-striped ribbon - such a fun twist on a 'jungle theme' baby shower. Diane is one of our creative readers who had never made a diaper cake before, and by the time she finished her first one, you would have guessed that she had made dozens of them because her diaper cake turned out so cute! Nicely done Diane and thanks for sharing with us! 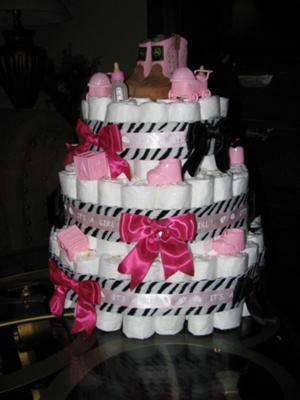 If you have your own diaper cake to share with us, go to the bottom of this page and follow the link! Since I was hosting my first baby shower I decided I wanted something different. I looked online and saw some pictures of the diaper cake and decided to give it a try. I could not believe how easy it was. I just started out shopping for for cheap baby items at the dollar store and then I decided to use zebra striped ribbon because my daughter's shower was the jungle theme. I also found some pink ribbon that said "it's a girl" and thought it would look good with the zebra stripes. My daughter had purchased the pink baby boots weeks ago so I decided to put that as the topper. My daughter loved it. She stared at it for hours..Of course got some pink and black bows to go around the cake. Everyone thought it was a REAL cake.